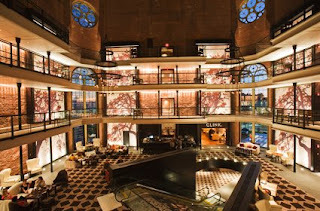 Boston, Mass - Be captivated, invites the Liberty Hotel. It's a rather blatant use of irony considering the building used to be the notorious Charles Street Jail. I was skeptical when I heard about this project. At best, I thought, it's gimicky. But I also feared it would be downright tasteless, mocking the prisoners who spent years enduring inhumane conditions in the old Suffolk County prison. But the end result, I have to admit, is pretty classy. 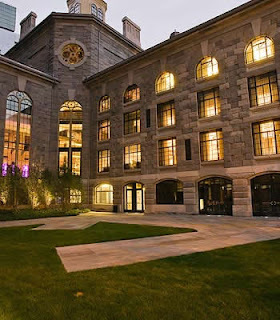 Most importantly, the Liberty Hotel has turned this graceful, granite building into a productive and - frankly - spectacular space, retaining much of the original architectural detailing. 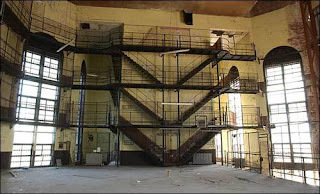 The catwalks still circle the five-storey lobby, its original rose windows flooding the place with light. The hotel has also preserved the history of this building, with a gallery of historic gallery in the lobby and plenty of whimsical nods to its former incarnation. 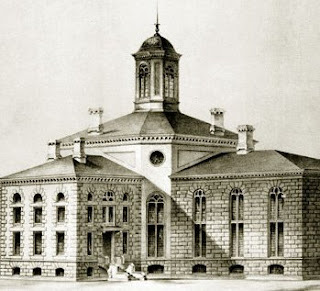 But the hotel does not gloss over the building's rocky history.When the jail was first built in 1851, the architect collaborated with prison reformer Louis Dwight. Together they designed the facility, experimenting with principles of humanitarian incarceration that were en vogue at the time. The building is considered an archetype of the Boston Granite Style (with granite straight from Quincy, Mass). Over the years, the jail housed many famous residents, including the anarchists Sacco and Vanzetti, black liberationist Malcolm X and Boston's own James Michael Curley (Indeed, this is where the would-be mayor lived when he was elected to the Board of Aldermen in 1904). Despite its auspicious start, the Charles Street Jail suffered from a lack of funding and therefore a lack of maintenance. By the middle of the 20th century, the building was severely overcrowded, conditions were miserable and there was a constant threat of revolt. On one occasion, two men found bugs in their soup and incited an uprising which would cause $250,000 in damage. I learned all this from the documentary video in the hotel gallery. Finally, a group of inmates brought a lawsuit against the county. Judge Arthur Garrity actually spent a night in the prison - on murderers' row - before making his decision. In 1974, he ruled that the inhumane conditions were unacceptable and the prison should be closed immediately. His ruling was finally carried out 16 years later. This is Boston, after all. And any job worth doing, is worth doing over budget and past deadline. By comparison, turning the low-down prison into a high-class hotel took only five years (and $150 million). Of the many tasks, one was inviting a group of monks to burn some incense, say some prayers and cleanse the property of any negative karma that might be lurking in the corners. No way were they starting a $150 million endeavor with bad Feng Shui. Photos courtesy of the Liberty Hotel. Somerville, Mass - Meanwhile, back in the Russian Federation, former President Putin reveals yet another talent. Not only is he a black belt in judo, a tackler of tigers and a former KGB spy, he also has a sensitive side... he is an artist. 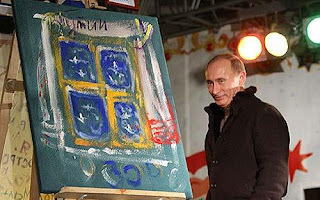 Putin's first painting was auctioned off for charity a few weeks ago, fetching over $1 million from a local collector. Putin was given the word uzor, or "pattern" as the theme of his painting. He chose to paint a frosty window, adorned with Ukrainian cross-stitched curtains, framing a view of the night sky. Art critic Richard Dorment provides more indepth analysis here. Western journalists were quick to point out the irony of the Ukrainian theme of Putin's painting, considering the recent dispute over Russia's supply of natural gas to Ukraine. According to the Daily Telegraph "the theme is replete with ironic symbolism with even the frost encrusted windows unwittingly suggesting freezing homes across central Europe after Mr Putin ordered all supplies through Europe to be cut." 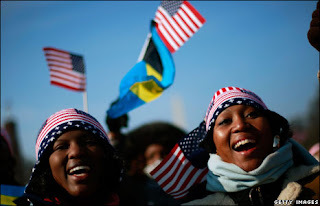 Washington DC - "For we know that our patchwork heritage is a strength, not a weakness. We are a nation of Christians and Muslims, Jews and Hindus, and non-believers. We are shaped by every language and culture, drawn from every end of this earth; and because we have tasted the bitter swill of civil war and segregation, and emerged from that dark chapter stronger and more united, we cannot help but believe that the old hatreds shall someday pass; that the lines of tribe shall soon dissolve; that as the world grows smaller, our common humanity shall reveal itself; and that America must play its role in ushering in a new era of peace." Boston, Mass - These days, my job basically entails eating my way around the city. Sure, I usually visit at least one museum or historical site per day. And I still have to inspect all the hotel rooms. But I have done all that before - especially since this is the fourth time in six years that I am researching Boston for various guidebooks. But no matter how many times you write about a city, you can never eat at all of the restaurants. And if you do, you can never sample all of their specialties. So it seems there is an endless array of food in this city. And it is my job to eat it all. Alleluiah. In Boston, no place is better for this particular job than the North End. With the completion of the Big Dig, the North End has finally rejoined the rest of the city, no longer isolated by the multilane highway or massive construction. Nonetheless, this Old World enclave is still a continent and a century away. Italian immigrants and their descendents have held court in this warren of narrow, winding streets and alleys since the 1920s. Old-timers carry on passionate discussions in Italian and play bocce ball in the parks. 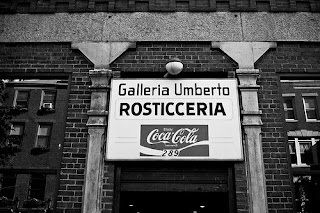 Others complete their ritual shopping at specialty stores selling fresh flowers, handmade pasta, cannoli or biscotti, fragrant spices and fresh baked bread. As you might imagine, the North End is at the center of the city's pizza wars (which I have written about before - click here to read some other pizza reviews). 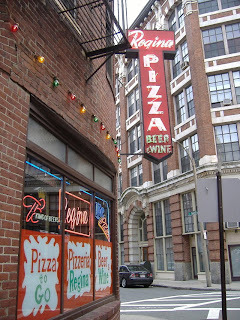 For years, I have been partial to Pizzeria Regina, with its off-the-beaten-track location and tough-talking waittresses. They take no reservations, and there is always a wait for a table. A line forms just before 5pm, and from what I can tell, it stays there all night, until the last customer is seated. Regina's is an institution. It's been around for ages. And even though Regina has opened up outlets in Quincy Market and the Prudential Center and (gasp) the suburbs, the original location in the North End is still the real deal. Cheap beer, thin-crust pizza, no frills. By the way, those other locations at the mall and in other places.... not the real deal. You have to go to the North End; otherwise you might as well be eating at Sbarros. 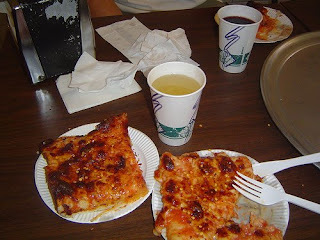 Anyway, yesterday was the first time I sampled one of Regina's rivals: Galleria Umberto. I never managed to eat here before because it is open only for lunch. In fact, the place closes when they run out of pizza, so it's usually shuttered tight before 2pm. Pizza connoiseurs rave about this place. 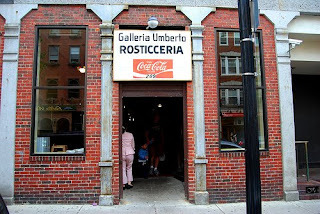 It's right on Hannover Street, the main drag in the North End, surrounded by sweet-smelling bakeries and high-end eateries. But if you're not looking for it, you'll probably miss it, because there is nothing to draw your attention to the plain storefront. Inside, it's even more innocuous, with a few tables scattered about a cavernous room, and the obligatory Italy posters adorning the walls. 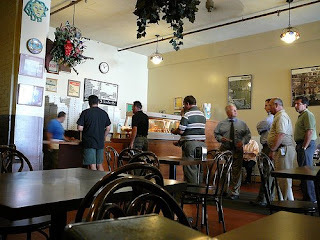 One guy stands behind the counter in the back, calling many customers by name, and serving up Sicilian pizza by the slice and sodas in the can. He's been doing this for almost 40 years. It's Sicilian pizza - those are the square slices on the rectangular tray - but it's not too thick and doughy. Most importantly, it is cooked well done, which means the crust is crispy on the edges (a rarity for Sicilian pizza). The sauce is a spicy and the cheese ratio is perfect, although it's a little oily. Your choices are presented to you when you order: "Would you like some salt and pepper on that?" Then the slice is shoveled off the tray and plopped onto your paper plate, you're given a plastic fork and you're good to go. A slice and a soda. Total cost $2.55. Now that's the real deal. Somerville, Mass - Today about 40 cyclers set off on a journey of a lifetime, departing Cairo on the first stage of the Tour d'Afrique. Among these riders are two of my teammates, Scott Kennedy and Sharif Rashedi, who will be riding from Cairo to Khartoum (this first leg is also known as "Pharoah's Delight"). 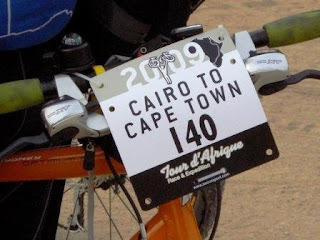 Follow the progress of the Tour d'Afrique here. Follow the progress of my Lonely Planet team members here. Although the Tour d'Afrique is underway, my section is still several months away. Thank goodness for that. But knowing that my team members are actually on their bikes at this very moment does make it seem like this crazy adventure really is about to become reality. "I'm a Canadian volunteer who has been working with BEN Namibia for the last 8 months and am so excited to receive support from someone like you. You're gifts are making a pile of difference." Thank you SO MUCH to everyone who has already contributed! I am so inspired by the generosity of my friends and family. If you have not already donated to BEN, click here so you too can make a pile of difference! That desk job followed on four months of researching and writing the Moscow City Guide and a bunch of other Russia-related stuff. So basically, the second half of 2008 was consumed with creepy castles, KGB museums, furry hats and pickled beets. Don't get me wrong, I love that stuff! But I'm thrilled to announce that Eastern Europe has been put to bed, as a book and as a region. The New Year brings new beginnings, new projects and new parts of the world to explore. For the next few months I'm going to be working in my favorite city on the planet: Boston! Okay, I guess that's not a new part of the world to explore, but perhaps I will find a new part of the city to explore...? A word about New Year's Resolutions. In 2008, I resolved to start a blog. And one year later, we're still going at it - Oorah! Thanks for reading!